Earliest mention of the name Tullgarn (Tyllegarn) is from a bull in 1262. The name Tullgarn has nothing to do with ‘tull’ (which is the Swedish word for ‘duty’) but is derived from ‘tylle’ (talldunge = pine grove) and ‘garn’ which is the word for a narrow bay or inlet. During the 1400’s Tullgarn consisted of a ‘village of six yards’. The castle’s first known owner was certainly Tord (Röriksson) Bonde and his son Knight Knut Tordsson Bonde. He gave the estate to his wife Margareta Karlsdotter as a wedding gift in 1408. It remained in their family until 1772. The first castle-like structure was constructed on the initative of Carl Sture. The castle or Sture castle was built on a rocky headland on Tullgarn Creek probably around the time of the Vasa Renaissance, roughly 1600. In the mid 1600’s the castle consisted of a large main building with three floors, two round towers and one square. Two wings extended from the main structure which joined to another building to enclose a central courtyard. The castle’s exterior appearance is known from an image in Sveciaverket after a model by Erik Dahlberg in 1686. During Count Per Larsson Sparres time, Tullgarn was renovated and fitted with a new roof. In 1685 the estate was turned over to Axel Julius De la Gardie and the Count Sparre took everything he could with him. This meant Axel Julius De la Gardie had to completely refurnish the interior. The castle stood relatively untouched, surviving the Russian raids in 1719 thanks to a stratagem by Posten P. Scharaff. In 1713 Count Magnus Julius De la Gardie inherited the old castle from his father Axel. By then the building was in poor condition and quite outdated. Through his marriage to Hedvig Catharina Lillie Magnus had access to a considerable fortune which gave him the opportunity to build a new castle. If the earlier castle was demolished completely is unclear, but likely only some foundation walls and cellars remained from the previous one. In 1772 Tullgarn was purchased by the state and became a royal summer palace. It is currently characterized by it’s neo-classical furnishings which date to the latter 1700’s when Gustav III’s youngest brother, Duke Fredrik Adolf received ‘Royal Right of Disposal’ to the castle. The interiors dating from Fredrik Adolf’s period are among the finest Gustavian interiors interiors in Sweden. 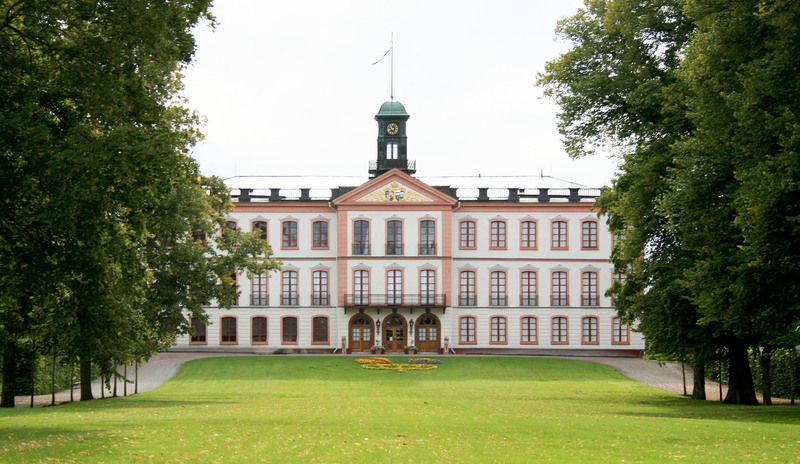 After Fredrik Adolf died, the castle passed to the crown and stood empty until 1805 when his sister, Sofia Albertina of Sweden temporarily moved in. In 1807 she received rights of use to the estate and spent every summer there until she died in 1829. In 1818, Parliament would pass to Crown Prince Oscar (to be Oscar I on coronation) upon Sofia Albertina’s death. He held the castle between 1830 to 1859 and he implimented a respectful renvoation. He also rebuilt the stable and added the orangery.